For most of 10-year-old Abby Furco’s life, she has only known one thing: cancer. The sweet 5th grader was diagnosed with leukemia in 2011 when she was only 4 years old. At the time, doctors only gave her a 20 percent chance of survival. For the next six years, the family did everything they could to help Abby and give her the best life they could. She underwent a bone marrow transplant, intense chemotherapy and radiation treatments, and a trial drug. In October 2013 came a ray of hope. 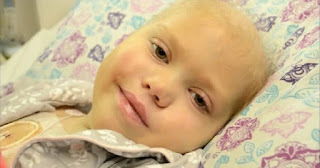 Abby had finished her treatments and for one “beautiful” year was able to be a normal kid again. She attended school, went to soccer practice, and joined the Girl Scouts. Then, the following September, the cancer returned, and this time it was worse than ever. She received another bone marrow transplant in February 2015, but just 15 days later she was diagnosed with Graft-versus-host disease, a condition where the donated marrow begins to attack the body. The next month her kidneys began to fail. She was put into intensive care and doctors told her parents that if they took her off dialysis she would only survive 48 hours. They put Abby in hospice care and her grandparents flew in to say their final goodbyes. Then they began the heartbreaking task of planning her funeral, picking out her casket and the music they would play. Then a miracle occurred – Abby woke up. “She told us, ‘I have so much living to do,’” Patty recalled. Doctors agree – there is absolutely nothing medically that can explain Abby’s recovery. “We helped her get home on hospice. But when we started backing off, taking away treatments so she wasn’t on so many meds, she started getting better all on her own,” said Abby’s doctor, pediatric hematologist and oncologist Jacob Wessler. Abby is now in remission and receives IV steroids twice a day. Her prognosis remains uncertain, but her family is hopeful. They are taking each day as it comes and enjoying every precious moment they get with Abby. Were you amazed by Abby’s recovery? So share this!